Hygge (pronounced "hoo-ga") has stolen the hearts of America. This Danish concept emphasizing comfort, simplicity, togetherness, and soulful living just feels right, doesn't it? Especially to families caught in the chaotic demands of modern life. 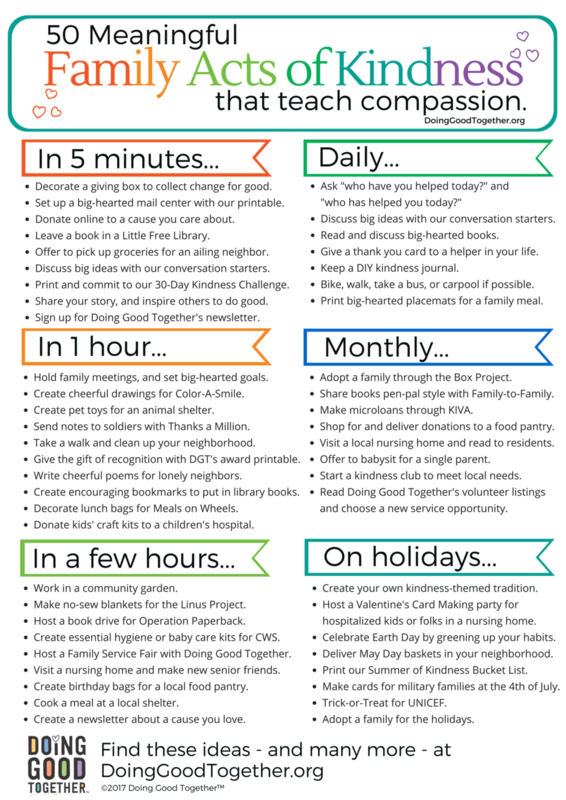 The concept of hygge is making personal lives better one infographic, article, and adorable book at a time. Here at Doing Good Together™ we'd like to make December a hygge-filled holiday, full of simple, daily acts of comfort and connection. Join us for our hygge-inspired countdown to the new year! Together we'll spread comfort and good cheer far and wide, with intention, mindfulness, and hopefully a ridiculous amount of hot chocolate. Take what you like (or love!) from this unique DGT-created collection. If you're up to tackling each of the 31 days, excellent! We'll be right there with you. If you're experiencing heart palpitations at the thought of more obligations, just browse the list and pick a (super easy) favorite, like number 13: Share candy canes with friends and strangers. Then maybe hop on over to our article on Self-Care for Big-Hearted Parents. However you use it, we hope this big-hearted countdown will make your December full of comfort, joy, and a great deal of hygge. Day 1: Agree to exchange a homemade holiday gift with someone on your list. The create it! Don't stress over your creative abilities. Everyone has a hidden talent! Check out DGT's big-hearted gift ideas on Pinterest for creative home-made options. Or grab a copy of Steph Hung and Erinn Jang's book Make & Give: Simple Modern Crafts to Brighten Every Day. Day 2: Donate toys to a local charity drive. Pick out a toy (or a few) with your child, and drop them off at any of the many collection locations across the country this time of year. Day 3: Set up a station to greet delivery workers. Visit our project page for instructions and a script for your public thank-you card! Day 4: Decorate and share HOLIDAY KINDNESS TEAR-OFF POSTERS. Start ripples of kindness by sharing compliments on public bulletin boards throughout your community! Simply gather your family around some cocoa. Decorate these fun printables (or several of them), and add your own kindness ideas to the blank spaces. Then tape them up at bus stops, coffee shops, or your local library. Day 5: Deliver treats to the staff at your local library. Celebrate their good work with homemade treats, candy canes, or a simple, heartfelt thank-you card. Day 6: Count the number of items in your pantry. Donate that many quarters to the food shelf. Make time to literally count your blessings. Then turn your gratitude into a donation. Day 7: Read a big-hearted book and discuss. Nothing brings hygge into my home quite like snuggling up with a good book. Try one of these new gems or browse our Read Together section to discover a new favorite. Day 8: Gather over cocoa and color cheerful pictures to send to COLOR-A-SMILE. Print their adorable seasonal coloring pages. Spend cozy family time coloring. Then send your cheerful pictures to Color-a-Smile to be distributed to deployed soldiers, nursing homes, and hospitals. Day 9: Bring poinsettias to someone who is lonely. This is a great excuse to visit a lonely or ailing fried or neighbor. Day 10: Bake (or buy) holiday treats to share with neighbors, along with holiday greetings. 'Tis the season for connecting with those around you, after all. Day 11: Buy a cup of cocoa for a stranger. Whether you pay for the person behind you in line or leave a coffee shop gift card in the hands of a stranger, this sweet gesture is sure to brighten the season for someone near you. Day 12: Create BIG-HEARTED AWARDS for your heroes. Visit our project page for details or print our template to get started. Day 13: Share candy canes with friends and strangers. Share a sweet gift of the blue! Day 14: Read holiday books with folks at a nursing home. Arrange a visit at a local nursing home or assisted living community. Many seniors love the opportunity to connect with youngsters. Sharing holiday stories makes your visit a festive event. Day 15: Create and share a video thank-you. Who has been especially helpful to your family this year? Make a special video thank-you to share your appreciation and love. Day 16: Decorate and leave CAR WINDOW POETRY as you run holiday errands. This creative project is so much fun! Gather for a cozy hour of cocoa while you decorate these simple, printable car window poetry cards with cheerful, encouraging words. Then leave them on vehicles in crowded store parking lots as you work through your to-do list. Day 17: Make a thoughtful coupon book for someone. A book of "snuggle" coupons, "one more book at bedtime" coupons, "extra chore" coupons, or anything else you can think of to comfort - or help - those you love. Day 18: Donate a cozy pair of pajamas and a good book to a local homeless shelter! Or make it a pajama party! Invite friends over for a pajama party. Have everyone bring an extra pair to donate for the Pajama Program, a unique nonprofit helping kids everywhere have cozy nights. Day 19: Leave thank yous and/or gift cards for service people: mail carrier, trash collector, etc. Let others know you value their work. Day 20: Facetime – or video chat – a relative you haven't seen in a while. This time of year often gets too busy to reach out to others. Today, make it a priority to reconnect. Day 21: Set up a MAGIC MAIL STATION with addresses of those you'd like to reach out to all year. Make it easy to reach out and comfort others all year long. Day 22: Snuggle up and watch a black & white holiday movie. Slow down with the original Miracle on 34th Street or It's a Wonderful Life. Day 23: Write a letter to the editor thanking first responders. Let your community helpers know they are valued, and learn how to write a letter to the editor! Day 24: Call a far-away relative or good friend and wish them well. Is there someone you wish you'd been able to see this month? Give that person a call and take time to catch up. Day 25: Enjoy a favorite family tradition together. Talk about holidays passed. How did your family traditions come to be? How did your parents spend their holidays? This is a great moment to reflect. Day 26: Invite friends and family to join you on a winter hike. Bundle up, bring along a thermos of cocoa, and marvel at the winter landscape. Day 27: Apologize to someone. Forgive yourself. Have you made any mistakes you truly regret this year? We all have, of course. Now is a great time to reach out with an apology. It's an even better opportunity to resolve not to make the same mistake again, and then forgive yourself. Day 28: Write thank-yous for your holiday gifts. Sit down together as a family to work on thank you notes. Or thank you videos. Day 29: Discuss: How were you a Helper this year? And how were you helped? Reflect on the Helpers you've encountered this month. Day 30: Spend some time alone. Enjoy the quiet. Day 31: Choose 12 FAMILY ACTS OF KINDNESS or HABITS OF KINDNESS to add to your family life over the coming year. Add them to your family calendar! Browse more tips and tools to start big conversations with your family.